During his time at Sunderland, the Black Cats faithful coined a phrase, ‘Michael Bridges, cool as fridges’. For those of us lucky enough to have witnessed the 1999/00 season at Leeds United when, at times, Bridges made the game look incredibly easy, the phrase was more than appropriate. Michael Bridges grew up dreaming of becoming a professional footballer and he openly admits that despite living in the North East he supported Tottenham Hotspur; his idols were Chris Waddle and the enigmatic Paul Gascoigne. Four days later, O’Leary got his man when Huckerby joined the club but that evening Bridges stole the headlines as in only his second appearance, he smashed a glorious hat-trick in an eye catching 3-0 win away at Southampton. The three goals were very different. The first followed a free kick which was lofted into the Saints penalty area and when the ball was knocked down, Bridges, on the edge of the box, teed it up before lobbing the keeper with an exquisite chip. “I was delighted to score the first goal which took a huge weight off my mind but to go on and score three was unbelievable and I even had a fourth goal ruled out late in the game. After an inconsistent start to the season, Leeds kicked into gear with a win at White Hart Lane which was the first of six successive league wins before a thrilling 4-4 draw at Goodison Park. “We were flying and felt unstoppable. 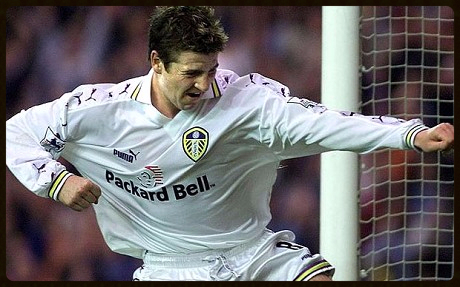 We went top of the league with a late win at Derby County and a couple of weeks later we won 2-0 at Stamford Bridge with two Stephen McPhail goals and the celebrations on the journey home that night were amazing, before a lock in at The Peacock across from Elland Road. “We were all left devastated after the horrific events in Istanbul, that game should never have been played and for a few weeks we were not mentally right after the tragedy. The summer of 2000 saw another striker arrive at Elland Road in the shape of Mark Viduka but Bridges was determined to carry on his breathtaking form and he started the new season up front with the big Australian. “I suffered the injury in the Champions League against Besiktas and was told that I would never play again and I should accept the insurance cheque from the PFA. “The Leeds physio, Dave Hancock, told me that he’d get me fit and I’d be a fool to take the compensation payment. I trusted Dave but it was a very dark period in my life. “Leeds were in trouble financially, heading for meltdown and that was headline news. Eddie Gray told me that I had to go as the club had hit the end of the road. I had six months left on my contract and I knew I would not be getting another one. Michael’s career took him on many travels as he played for Bolton, Sunderland (for a second spell), Bristol City, Carlisle United (for whom he scored at Elland Road), Hull City, Australia and then back to Carlisle on loan. Then, after a single appearance for the MK Dons, Bridges returned to Australia where he retired at the end of the 2013/14 season. Thank you to Michael Bridges for his time and giving me the opportunity to write this article.